The apprtament is great. Super location and only 5-10min walk to st pieters square. The owner is a very nice guy and very helpfull, he already made our stay from the 1st minute very pleasant. Overall a great experience in Rome for our family of four. We learned where to shop for bakery goods, salami, and cheese so that our eating expenses were minimal. Some good, inexpensive family restaurants just around the corner. The apartment was very comfortable and fairly quiet (except for New Year's Eve!). Convienent to the metro--we went all over using a 1-week transportation pass. Had some problems with showers running hot and cold, but this was a minor inconvenience. The owner speaks good English and was helpful to us. 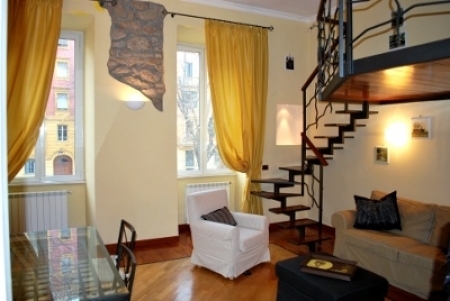 Great location in Rome, beautifully appointed apartment, well equipped. Helpfully and friendly contact. No toaster, but this is minor. Our stay in Rome was very pleasant. The apartment was exactly as described on the website. It's near the Metro and within easy access to buses.The area around the apartment had many supermarkets (Naturasi), bakers and RESTAURANTS.The apartment owner was friendly and very helpful.Would go back pleasantly. Apartement was leuk ingedeeld en aangekleed. Prettige en gezellige buurt met mooie en grote overdekte versmarkt en spar op 8 minuutjes lopen. In de buurt heerlijke ijswinkel, patisserie, allerlei winkels etc. Keuken redelijk uitgerust, pannetjes zijn wel aan vervanging toe. Goede oven, afwasmachine en koelkast, prima airco en wifi. Er staan al afwas en schoonmaakmiddelen, toiletpapier en een lekker flesje rode wijn. Eigenaar Felice spreekt goed Engels, per mail en sms uitstekend bereikbaar en zeer behulpzaam. Redelijk proper voor een mediteraan land, maar niet zoals we in Duitsland en Oostenrijk gewend zijn. Spiraalmatrassen, ietsje harder dan thuis, maar prima op gelegen; in het tweepersoonsbed rol je gelukkig niet naar het midden en geen opstaande rand, mocht je wat langer zijn. Katoenen beddengoed. Al met al, kunnen we het zeker aanbevelen en zouden we het zelf ook weer boeken. Let me first say this was my first trip to Europe and the first time I've ever rented an apartment instead of staying in a hotel. I must say that Felice was very helpful when it came to letting us leave our luggage in the apartment before it was ready for our occupancy. He also arranged for transportation to an from the airport for our group of 5 and was available by phone if we needed him. The apartment itself was OK but we had major plumbing problems for a full two days.We could not use either toilet because they overflowed when we flushed and both sinks and both showers in the bathrooms would not drain. Felice had to call two different plumbers over a 48-hour period before the problem was resolved. The smell of toilet permeated the apartment the entire rest of the week despite our efforts to alleviate by opening the windows as much as possible. We were extremely disappointed. The apartment itself was adequate - once we could use the showers we really had no problem with water pressure or temperature that others had complained about. It was a good location for the tourist attractions we came to see and was very close to the metro. We found the other reviews on this site to be accurate. It is a nice apartment, close to Metro and walking distance to Vatican. The bedrooms are a nice size, and there is a large livingroom with loft that is fun for kids to play in. The owner is helpful with airport taxi arrangeents and restaurant recommendations and makes himself available. The hot water in the shower has a tendency to change temperature but it's not really a huge issue. One shower is very, very small, the other bathroom has a whirlpool/ shower combo. The kitchen is well equipped and there is a washing machine- though not a dryer which is rare in Italy anway. Our family really enjoyed staying in this apartment and would do so again. You never know from photographs and descriptions if "what you see is what you get". In this case, it is. We were more than pleased for our family of two adults, two young children with the location and size of this unit that will comfortably sleep six. It has two separate bedrooms and a useable kitchen and nice back balcony. The metro stop was just down the next block and its an easy, ten minute walk to the Vatican passing the shops along the way. We would absolutely stay here again as we enjoyed being embedded in the local, less touristy scene while being able to get easily to the sights. The metro is easy to use with no safety concerns for us, and got us anywhere we didn't choose to walk. But in Rome, you can't avoid but to want to walk, for every corner offers an eyeful of amazing architecture and fascinating sights. Feliche, the apartment owner, is very hands on and answered any questions we had immediately. I understand what guests were referring to about the hot water in the shower: you do get brief changes in the shower temperature, from warm to hot or hot to lukewarm, changing in part because you are manually trying to adjust the temperature. If you know it's coming, it's manageable and you just step aside a bit. It didn't bother me at all and even my children managed it without a whole lot of comment. But I was curious as to what exactly the issue was. That's it. Overall, we'd rate the apartment a 4.5 out of 5. We were very pleased with it. From reservations to use to check out, it was all very easy. Great apartment, great host (Felice) and a great city!! We had an amazing stay in Rome, Italy. Our apartment rental was in an excellent location for all means of transportation ( Train, Bus or walking). We were able to walk to Vatican, Spanish Steps and Trevi Fountain. The bus rich up front dropped us in front of the Coliseum. Felice was very helpful and went above what you expect from a host with taxi service and train arrangements to Venice and Milan. We will definitely return and stay there. The location was great - a block and a half from the Metro and a short walk to the Vatican. The owner was very helpful and friendly. The only minor negative was the unpredictable hot water. We would definitely stay there again! Appartement très confortable et très bien équipé. Il est situé dans un quartier calme et en même temps à proximité des commerces, du quartier du Vatican et d'une station de métro reliant le centre. L'acueil des propriétaires est par ailleurs très sympathique et disponible. We had six college age men staying in the apartment for the week and there was plenty of room for all of us. The best part of the apartment was its location. Being only a ten minute walk from the Vatican and three minutes from a subway stop was a real blessing. I would highly reccomend this apartment. Thank you Felice. It's a very nice appartment with all facilities. Felice who owns the apartment was very helpful and helped us arrange for transportation to and from the airport. The location is good, close to the underground and only a 5-10 walk to the Vatican. Very friendly and good service, the apartement is excellent located and has a convinient atmophere. We would book again. Very nice location, short walk to Metro. Also 10 min walk to St. Peter's and Vatican. Great food market nearby - called Triumfale - if you need stuff for breakfast / lunch. We got loads of great food there... Also recommend two restaurants in the area: Caccio e Peppe and Isla de Pizza. The water in the shower was a bit unpredictable going from warmer to colder back and forth, but we were fine with that. The building is quiet. Has an elevator (very small). and balcony going out into the back. Also, the shower in one of the bedrooms is very very tiny. Very Euro style. The kicthen well equipped (wish there was a bigger coffee maker as we could only make a cup and a half of coffee at once). Very clean place, plenty of towels, sheets were nice and new, There were 4 adults in our party and we were very comfortable and had plenty of space not bumping into each other all the time. I would recommend to friends. The owner very pleasant and available when needed, offered helpful hints. We had a very pleasant stay in this apartment. The apartment is very well equipped (you don't need to rush to the store to get detergent!!). The location in Rome is perfect. Try the organic food store 'Bio mens' on the corner!. Felice was very friendly and helpful. The street is a bit noisy, but that doesn't matter if you sleep in het back..
We really enjoyed our stay in this appartment. It is ideally located with a bus station in front of the house and the metro A station ottaviano in 5 min walking distance. The appartment was clean and charming. Felice was a perfect host and easily available via phone or SMS in the case of questions. Try the sugar bakery in the via barletta (right side) walking to ottaviano! We loved it ! whe spent very nice days in this apartment: it was clean, comfortable. we've been there with our three children and it was spacious enough. It touk us five minutes to go to the Metro station (ottaviano), there were little super markets near the apartment, and a covered market open every morning...Most of all, mister Lucianii, the owner, was gracious. We've never met such an owner before! We stayed at this lovely apartment when we visited Rome in December 2010. This apartment is beautiful. The bedrooms are a nice size, and the beds are very comfortable. The bathrooms are very nice; the larger bathroom had a large tub and whirlpool. The living room has a comfortable sofa bed. The owner Felice Luciani was so gracious to us. He ordered a large taxi for us to meet us when we arrived at the airport. He also arranged for another large taxi to take us to the airport when we left. The apartment had clothing soap available for us, and everything we needed. The location was ideal. We were very close to the vatican, and also very near the subway. A really nice bakery was within walking distance. We had a lovely time. The flat was also great - thanks to the play corner. The kitchen was equipped perfectly, so that we could eat (family with 2 wild boys) well there. Everything was very clean. Besides, existed a small emergency ration (coffee, biscuits, bag soup, wine etc.) what was very pleasant in view of our journey on Sunday evening. If a small bar in which one can supply himself very well also however subtends. The situation - not far from underground and Vatican - and with the bus stop directly before the door was excellent. The line there 271 takes there a (Kolluseum) everywhere. We will come again! Many pleasure to Mr. Felice! We stayed in the apartment at New Years Eve and it was very nice. The renter Felice was also very nice and he helped us if we had questions.The position of the apartment was very central, so we had a metro station near the house and the St. Peters Dom was only 5 Minutes to walk. There also have been shops and restaurant round the apartment. Our apartment itself was very clean and comfortable, we liked it a lot. A real pleasure. The apartment was great, clean, confortable with 2 bathrooms. The accomodations were outstanding and the location very convenient for seeing Roma : 5 minutes walk from Vatican museum and 2 metro stations from Piazza Di Spagna. Mr Felice was a wonderful host for our stay. We defenitly recommand this apartment especially for families with children.